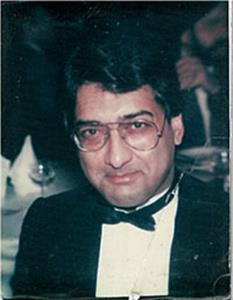 Yashpal Gill died of a brain tumour in 2002 after a very short illness – he was just 50. He was a self employed accountant and a very active man. His death left his wife, Bali, and two sons devastated. It all happened so fast. Having been away, I immediately noticed a change in Yashpal. He was very restless and forgetful. Yashpal was always a very active man (he had been captain of hockey and cricket for a Surrey league) and throughout the whole thing he never had a headache. I thought that perhaps it was the stress from the last two months – January and February are the worst times for accountants – perhaps he was even having a breakdown? He saw a GP and immediately a referral was made to a neurologist at the local hospital. His GP immediately referred us to a neurologist who we were able to see just a few weeks later. A cat scan was organised and immediately we received the bad news; it was cancer – a brain tumour. Yashpal was admitted immediately to Charing Cross Hospital. That weekend seemed to go on forever. We were under the impression that he would be operated on over the weekend. Nothing happened over the weekend and I was told he was not an emergency. On Monday we were seen by the neurosurgeon. He said it was very bad news, he had never seen such a deep rooted tumour with such a spread. It was a Grade IV tumour. He later said he was surprised Yashpal had survived so long. The neurosurgeon said he would have to install a shunt to release the drain fluid that was causing pressure. The next day the procedure would be done and also a biopsy would help to understand the nature of the tumour more. He was taken into theatre for the procedure but, unfortunately, he deteriorated very quickly after that. He could not talk and gradually he was bed-ridden, having lost all semblance of balance. Within a week he was worse – still eating and drinking, but he was in a vegetative state. He spent the last five months of his life like this in the hospital. Radiotherapy was given, but it didn’t have any effect. On the 22nd September of 2002 he died, but not before I had contacted one of our sons who was away on his gap year in Nepal – I had to call him to come home to say good-bye to his father. It is eight years now and both our two boys are living independently. Life has been hard, not just financially – his affairs were not in order and I had to organise the sale of his business. However, I wish I had been able to talk to him before that last procedure when he stopped speaking. I would have loved to have been able to understand what his last wishes were and it would have been helpful to have had some advice about our future. I am alone now. Yashpal has left a big gap in my life.